Any sub can be made into a wrap and/or pressed. * Indicates that this isn’t a Boar’s Head ® Item. Buffalo Chicken, Lettuce, Tomato, Onion, Ranch Dressing **This is not a Boar's Head Item. ..
Chicken, Cucumbers, Parmesan Cheese, Romain Lettuce, and Caesar Dressing. 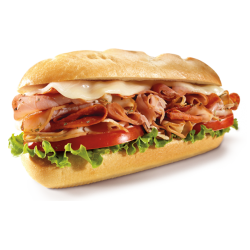 *This is not a Boar's..
Ham, Turkey, Bacon, Provolone, Lettuce, Tomatoes, Mayo, Mustard..
Ham, Genoa Salami, Provolone, Pickles, Mustard..
Ham, Provolone, Lettice, Tomatoes, Mayo, Mustard..
Ham, Salami, Pepperoni, Provolone, Lettuce, Tomatoes, Onions, Italian Dressing..
Tuna Salad, Lettuce, Tomatoes, Mayo..
Turkey, Provolone, Lettuce, Tomatoes, Mayo..